Combine in an iced mixing glass. Stir, and strain into a cocktail glass, or strain into fresh rocks in a rocks glass. Either way, garnish with a cherry or a twist, or both. Okay, some people claim that the Martini is the King of Cocktails. They would be wrong. The cocktail was invented in America, and thus the “King” should feature American whiskey. The original cocktail: spirits, water, sugar and bitters find its peak expression in the Manhattan. The whiskey, mellow with vermouth, is sweet enough not to require sugar, the water comes from the ice and the bitters top the whole thing off. The Manhattan was invented around 1860-1870 and is named after the borough in New York City. It is simple, but there are probably as many ways to make it as there are people in that city. Choice of whiskey, choice of vermouth and choice of bitters all play a role, as does how long it is stirred and what garnish is chosen. I tend to judge bartenders new to me on their ability to mix a Manhattan. Purists will require Angostura bitters, and there was a bit of a panic in 2009 when the factory that makes them shut down. Luckily they are back now, but I also like to play with different aromatic bitters in this drink. Notes: The whiskey I used was 15 year old I.W. Harper. I.W. Harper is a historically important brand started by Isaac Wolfe Bernheim, who is said to have used “Harper” to make it more acceptable in the marketplace. Now owned by Diageo, the brand has been unavailable in the US for 20 years, but now it is back. I bought a bottle of the 86 proof limited edition 15 year old straight bourbon, and the moment I tasted it, it was all I could do not to stick a straw in the bottle and finish it off (I actually don’t drink very much but you can see how much of that rather recently purchased bottle is left). The vermouth I used was Carpano Antica, bought in small bottles so that it is easier to keep fresh. 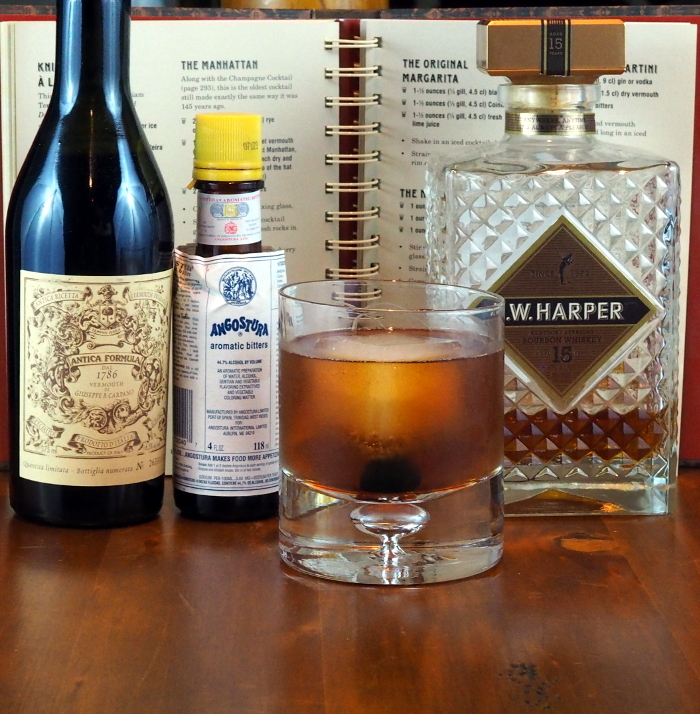 You want really fresh vermouth for all drinks, but especially the Manhattan. I did use Angostura bitters, although I’ve been very pleased with other types of aromatic bitters as well. I used a Luxardo cherry as the garnish.